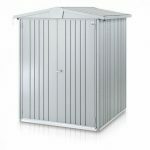 A large shed can make a big difference to how much you enjoy your garden, and this wide and deep metal shed from Store More is a good choice for those wanting a good sized storage facility without having to spend too much. 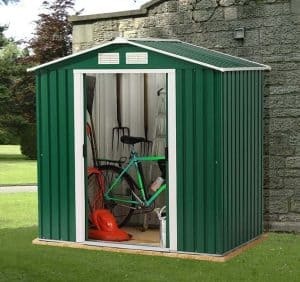 Because of its generous floor space, as well as the wide opening double doors that allow easy access to the interior, this shed is not only suitable for garden tools and accessories, it could even be used to store bicycles or machinery. Thanks to the apex roof rainwater simply runs away, whilst snow finds it harder to settle. This not only keeps the contents within dry, it reduces the likelihood of unsightly rust forming. This pattern is also repeated by the use of painted and galvanised cladding inside and out, which is very water resistant as well as creating a strong and stable structure that can stand up to the wind. One feature we particularly liked is the strong, full width entrance and exit ramp. It provides added value and functionality, and makes it much easier to transport goods of any shape or size in and out. With the addition of a padlock as well, unfortunately not included as part of the standard package, this can also be a secure place to keep your tools and more. 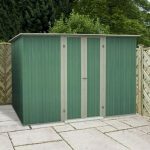 This metal apex shed won’t ruin the traditional look of your garden, because it’s been painted in a dark green colour scheme with white detailing. We really liked the rustic effect, and it will blend in well with ivy or against a background of shrubbery. It shows that not all metal sheds have to look alike, and yet it still provides the advantages common to all metal sheds of advanced durability without the need for annual treatments. The apex roof itself is quite pronounced on this shed, so there’s no chance of precipitation being allowed to settle. This is shown by the contrast between the ridge height of 1.89m with the eaves height of 1.60m. 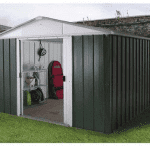 When selecting an area to use as the shed’s base you’ll also need to know the external width of 1.95m and the external depth of 2.33m, although these are both extended when the overhang is taken into account. We were pleased to see that while this shed is reliant upon thin and light metal cladding, the assembled structure is solid, strong and form. The hot dip galvanisation process has helped with this, adding resilience to the inner steel core. We were pleased to see that the cladding has also been folded, a cost effective way to increase its strength and rigidity. 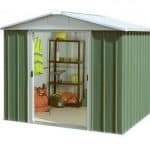 There is no floor provided with this shed, as it’s designed to be installed onto an existing area of level concrete. 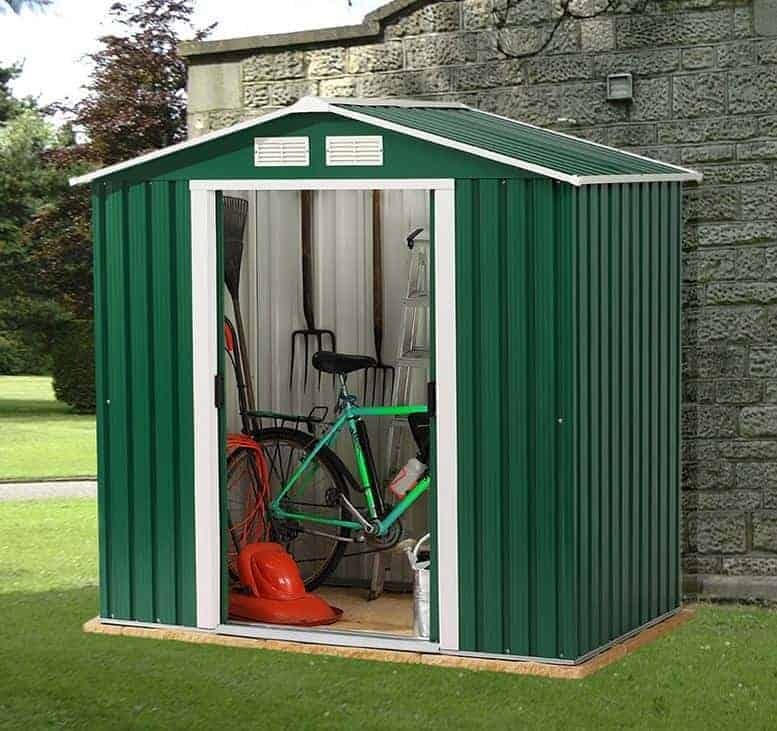 Unlike some other sheds we review, however, there is no anchor kit supplied as standard. This means that the owner will have to purchase a suitable set of anchoring screws, or purchase the steel foundation kit that’s offered as an optional extra. Because the shed is already painted, and because the paint itself is so long lasting, there are no treatment requirements for the shed’s owner to follow. The combination of strong galvanised cladding and an apex roof will also ensure that rust finds it very hard to form, which is why we were surprised that the manufacturer’s warranty offered against perforations caused by rust wasn’t longer than ten years. We were pleased to see that the double sliding doors are fitted internally, as this ensures that they aren’t left open to either the elements or the attention of potential thieves. The width of the doors is a very useful 0.90m. With the use of the full width ramp this means that it’s very simple to move anything into or out of storage, particularly if a trolley or the optional wheelbarrow is used. With a height of just 1.54m, however, you’ll have to be careful if carrying tall objects in. There are no windows, but that doesn’t mean that the shed feels hot or stuffy inside. We liked the large yet unobtrusive vents on the gables, as this ensures a plentiful supply of fresh air to the interior, and it can also help to prevent the build-up of condensation. With security always an important consideration for shed buyers, we were disappointed that a padlock wasn’t included with the shed. The handles are holed to accept a padlock, but without one this couldn’t be used to store valuable items. Once a suitable lock is fitted the lack of windows, which prevents passers by from finding out what’s kept inside, will also help to create a secure storage environment. 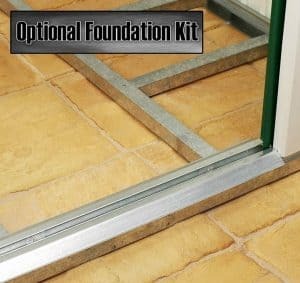 If you don’t already have a suitable concrete floor to install this shed upon, in which case you’ll need to buy an anchor kit or set of Hilti screws, then you can purchase a steel foundation kit at the time of purchase. This makes constructing a perfectly sized concrete base quick and easy, and it can even be used to lay a timber floor upon, although this would also involve the purchase of timber such as decking boards and a damp proof membrane to prevent rising moisture. At £75, the foundation kit will significantly add to the initial outlay. The neat and even paintwork is just one indication of the high quality that runs throughout this shed, another example being the strong and useful ramp. Although the cladding is folded, which adds extra strength on top of the galvanisation, we would have liked to see it a little thicker and backed by a longer warranty. The width and depth are well proportioned, meaning that there’s more than adequate floor space, but the overall storage capacity could have been greatly increased if the eaves were higher. 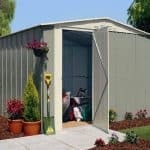 Even though many of the parts look quite similar, and there are lots of small items, the clear instructions make installation of this shed a quick process. With a friend to help, you can have it fully assembled in around four hours. 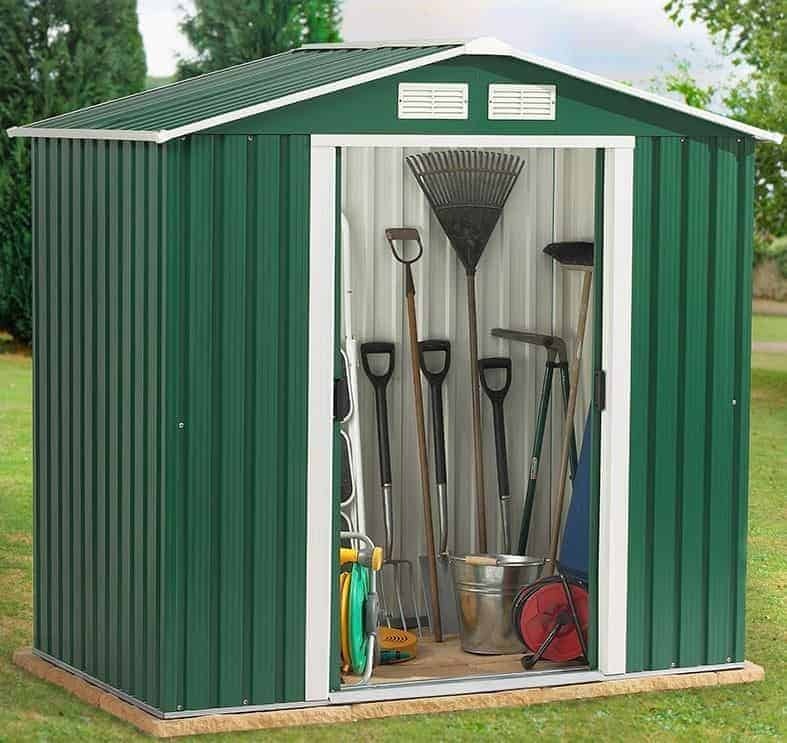 We liked the look of the shed, and the quality of its components, yet there is extra expense incurred for the purchase of either an anchor kit or a foundation kit. We would have liked to see at least one of these options included at this price. Final Thoughts: We were struck by the dark green colour scheme at first sight, yet we were also struck by the relatively low height compared to its other dimensions. Whilst there is room for improvement however, for one we would have welcomed the inclusion of a secure locking system, it still performs well and will provide a rain proof storage facility for small to medium sized gardens. It’s not just rain that is kept away, by both the apex roof and the painted and galvanised cladding, condensation is also discouraged thanks to the air vents included within the gables. For these reasons, even temperature and moisture sensitive items can be stored inside.